The allure of secret sin and the enticement of peer pressure had a strong hold on teens a century ago. Young Gavin knew it was time to venture out beyond his secure environment called home. His longing for independence has become a tainted mixture of stubbornness and pride, but it doesn't take long for him to realize that following the crowd can be risky business. The change that takes place in Gavin's life irritates his friends to the extent that, through vicious threats and heckling taunts, they place him in a predicament that could cost him his life! From Anonymous of Griswold, Iowa on 2/28/2019 . This book shows a very beautiful example of what God can do with and how he can use a will and life that is completely under his control. I definitely recommend it. From Melonie Luck of Morehouse, New York on 10/12/2018 . 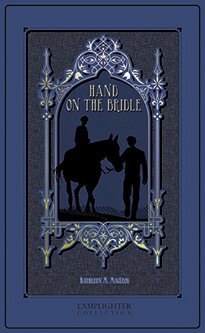 My 11yo daughter selected this book thinking it was about horses... Well, the title is merely a metaphor, but I really liked this book! I recommend it for anyone of any age, but especially if you're dealing with a strong-willed child or teenager or one who just seems to hurt others with no apparent qualms in doing so. This story is a great challenge to them to realize the folly of their ways and to accept what may come as God's hand guiding the way. This would be a great read aloud, especially if you take time for discussion. Loved it! From Suzanne of New Kent, Virginia on 10/26/2017 . I LOVED this book. My favorite quote (because I can relate to it) is, "You are allowing your will to make you stubborn, and it was meant to make you strong." From Joy Durmaz of Live Oak, Florida on 9/18/2017 . This book is so good. I read it in one day, staying up till one in the morning. It has been a long time since I have found a book I could read nonstop. I highly recommend this book for anybody. It is all about having self control with Christ's help and has convicted me to work harder to control myself even if I am angry with my syblings. Thank You, Lamplighter for publishing Christ honoring books! Can't wait to see what's next! From Anonymous of Pleasant Hill, Iowa on 12/13/2016 . My 20 year old grandson really enjoyed this book. He wished that it wouldn't have end so soon. I read it to him as he drove on an 11-hour trip. We both felt that it was a very good book. Well worth reading!